Revolution Slider Error: Slider with alias slider-delegaciones2 not found. 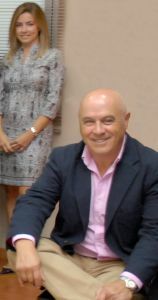 Jesús Ovelar, President and CEO of OVELAR S.A., has inspired and forged a business strategy of great success. Creating and maintaining his Corporate Culture, he has led OVELAR to an incredible development from its creation up till now. In January 1970 Jesús Ovelar begins his career as a sales representative of a factory of rolls for cash registers and calculators. At that time all his capital was 7,000 pesetas (42€). Two months later he becomes independent and rents a local of 20 square meters in Barrio del Pilar, Madrid. He and one employee are the Company asset. In April 1973 he acquires his first commercial premises: 300 square meters in the street Hermanos Machado, Madrid. The hard and tirelessly work begins to bear fruit: a customer base that has trusted, from then until now, in the professionalism of Jesús Ovelar. His charisma and vision make a difference with the others: he is not only a business man; he is a professional who advises his clients and who commits to their projects, always looking for the best solutions. In March 1974 OVELAR gives its most important step: the acquisition of a roll slitting machine. The team then consists of 7 people. Soon the local becomes small. Market demand makes OVELAR to expand a new business line, labels printing and manufacture. In the spring of 1975 the production moves to Arganda del Rey, with 14 employees and a production plant of 1,000 square meters. The offices stay in Madrid, and Ovelar moves towards his present: to be a referent in the sector of labels. In 1982 the production plants reached 2,000 square meters and the billing amount exceeded 1,000,000 €. Jesús Ovelar says that his continued success is due, firstly, to the constant investment in state-of-the-art technology, and secondly, to be surrounded by the best team of workers. But above all, it is based on listening to the customers’ needs. From its beginning up to the present, the projects proposed to meet the needs of a changing market have been the main engine for OVELAR to attend to professional trade fairs, both as exhibitor or visitor, always searching for solutions and innovation, collaborating with the best professionals. Jesús Ovelar is the reflection of the self-made man, optimistic, tireless worker and confident in his ability. He has done, and still does, business “on the street” and customer values it highly; in fact he still holds his own customer base and he is the first commercial agent of the company. Today OVELAR has over 32,000 square meters of production plants and has the best technological equipments, but the most important is its human capital. Jesús Ovelar says: “My asset is my TEAM, committed and faithful people that live changes and technological developments with interest and desire to excel, but above all with unwavering loyalty”. Our slogan was and is: A growing based on Effort, Improvement and Team Spirit.